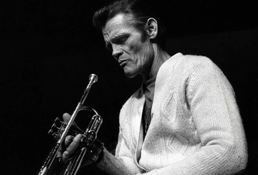 Chet Baker was a primary exponent of the West Coast school of cool jazz in the early and mid-'50s. As a trumpeter, he had a generally restrained, intimate playing style and he attracted attention beyond jazz for his photogenic looks and singing. Although his career was marred by drug addiction, he kept playing and singing well into the 1980s. Some of his last recordings in Europe were captured by Japanese independent label Marshmallow Records.